Cam and I are excited to be appointed to a church in the area where we have raised our family. We look forward to building relationships with each family here while working together to fulfill God’s vision and mission for Courtland-Oakfield UMC in becoming people who love as God loves by delivering hope, healing, and hospitality to our community. ​If such labels must be used, our style is traditional; but we like to think of it as simple, warm, and accessible. How you dress isn't particularly important. Wear a suit or shorts. Be comfortable. We are barrier free with a ground level entrance on the west side of the church building, and an elevator to all floors. We are also equipped with T-Loop technology in the room where we worship. ​Children of all ages are always welcome. 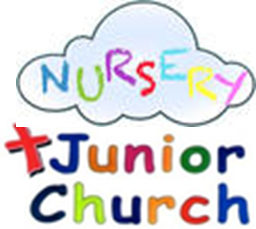 Our infant/toddler nursery, for children who have not reached the age of 4, is staffed by two vetted individuals every Sunday morning during worship. For children ages 4 and up, Junior Church is provided during the sermon time of Sunday worship, except for holiday Sundays (Christmas, Easter, for example), the first Sundays of the month during June and July, and all of August.